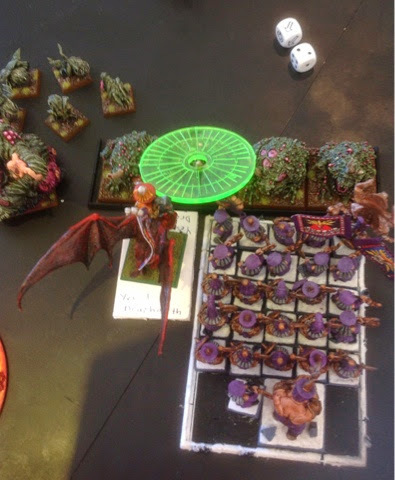 Recently I took 3000 points of chaos dwarfs against some daemons of nurgle. 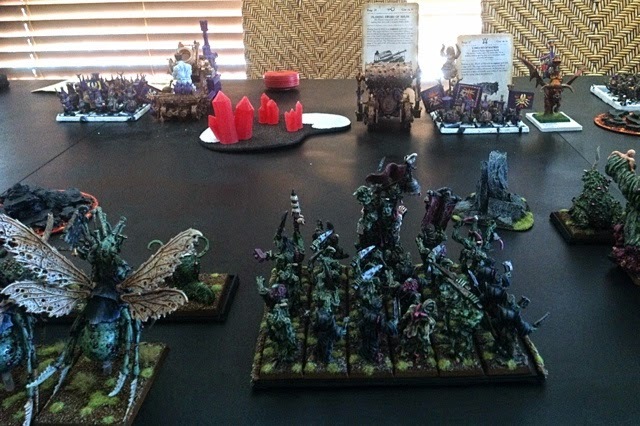 I was rocking drazhoarth, a bull centaur Taur'ruk, a level 2 daemon smith and a BSB, two units of infernal guard, 38 hobgoblin archers, the dread quake mortar, iron daemon with skull cracker and 3 bull centaurs. 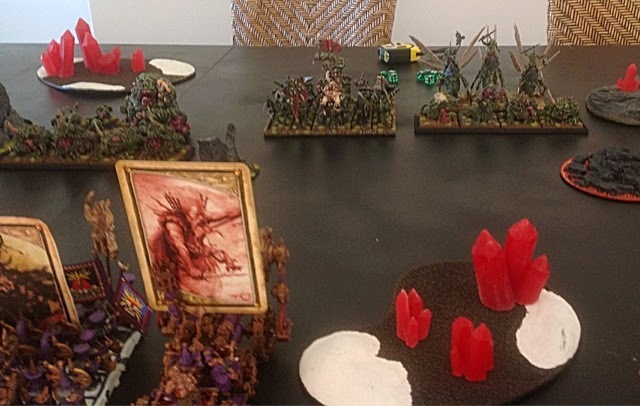 My opponent was rocking the double papa nurgle, epidemis, 2 units of four beasts of nurgle, 2 units of plague bearers, three plague drones, furies and lots of nurgling bases. 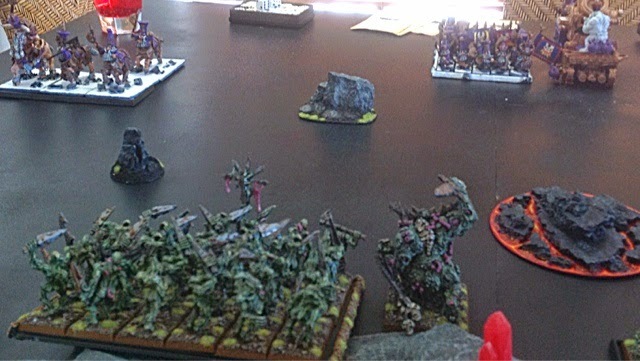 The plan was to rush the right flank with the bull centaurs and the skull crackers up the middle. The infernal guard and drazhoarth would rush the beasts with his fiery attacks and the banner of eternal flame on the warriors. 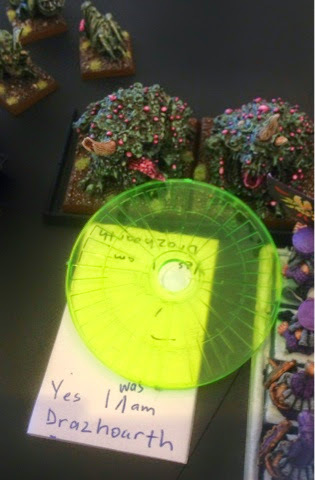 The dread quake would reduce epidemis and his unit. Well things did not go to plan- the skull cracker got nervous and then failed the charge but the big one was when drazhoarth and the warriors made it into the beasts he got hungry and unleashed flames of azgorth which of course scattered back onto him. As the pic shows of course both drazhoarth and cinderbreath disappeared and although the warriors dispatched the beasts, papa nurgles finest decided to take out the bsb and his unit. 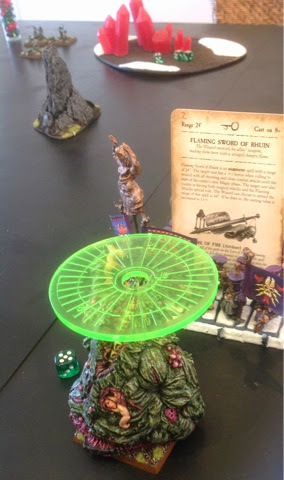 The only highlight was a direct hit from the dread quake before he charged in and killed the bsb which caused the unit to run. Don't use direct damage spells in close combat which scatter - the laws of warhammer will mean it will scatter onto you lol. Hobgoblins are pretty useless but in a horde can hold off lots of nurglings for a couple of turns. Use a destroyer in big games. I love the destroyer but in small friendly games you will lose friends! Bull centaur unit need to be at least six strong plus a Taur'ruk.